In Healthy Hips for Contact Sports Part 1, we discussed how hinge patterns in the hip joint are important for everyone, including your athletes participating in contact sports. In order to stabilize and receive a check or hit, you need to be able to absorb the force in your hips to protect your back. In part 2 we are diving deeper into helping you disassociate pelvic movement from lumbar spine movement. Many people lack mobility in their hips and pelvis therefore their body demands additional movement from the lumbar spine. 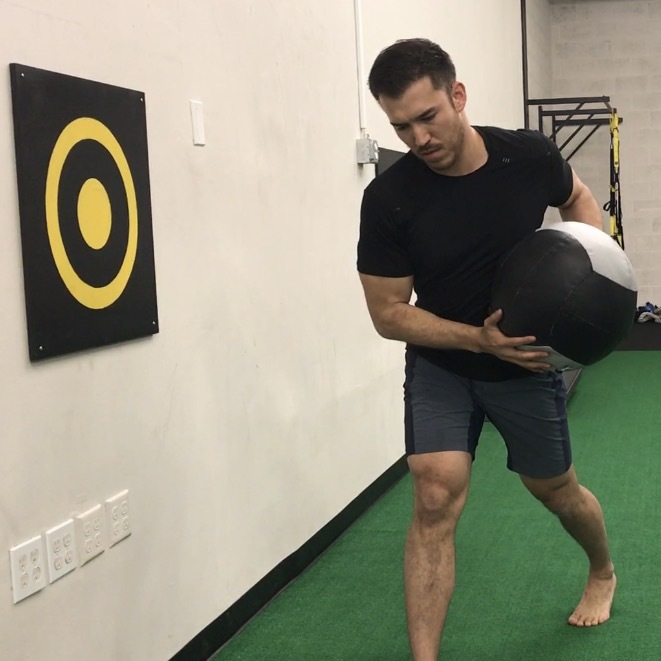 This sequence will help you to work on getting more movement out of your hips and pelvis, therefore protecting your low back from being pushed too far out of its comfort zone. lay supine with your knees bent and feet planted into the ground. Start with decompression breathing, filling your lung field 360 degrees around, focus particularly on getting your inhale to the posterior area of your lungs (breathe into the floor). imagine a clock sitting under your pelvis on the ground, while maintaining control in your lumbar spine, tilt your pelvis up towards the 12o’clock position. hold here for a few seconds, then move to 3o’clock, to 6o’clock, to 9o’clock and back to 12. Do this a few times clockwise and then switch to counterclockwise. Lay in supine position next to a wall or rig. place one leg upright on wall/rig with the other leg extended in front of you. The more flexible you are in your hips, hamstrings, the closer you will be able to get your upright leg to the wall/rig. Find a comfortable position for you. focus on neutral spine and avoid rib flare. Dorsiflex and ankles and find neutral foot position (for most of us, we will naturally be inverting our feet in dorsiflexion so attempt to pull your foot into eversion). flex the hip of the leg on the floor to meet your upright leg. Without losing your neutral spine, lower the leg back down to the floor. Put 80% of your weight into the front leg, keeping the knee joint posterior to the ankle joint. Find a tall neutral spine position, hinge hips back, keep weight in the heel of your front leg. Rotate your back leg internally as you hinge your front hip deeper back. Isolate the subtle movement to your hips as best you can, demanding control from your lumbo-pelvic musculature. Assume split stance/lunge position from above. Keep front leg closest to the wall. Start about 12-16 inches from the wall and slowly move further to increase difficulty. Work on loading the rotation/hinge pattern from above.